Killhouse Games is a small, indie development studio that was founded in Bucharest, Romania in 2012. They released their first game, Door Kickers on PC back in 2014 and it has since found its way onto other platforms including iOS and Android. The game is critically acclaimed and popular with the gaming public with a Metacritic rating of 83 and a User Score of 7.9. The game also has 94% of the 4,587 reviews on Steam being rated as positive (which equates to a "Very Positive" rating) and has 4.5 stars out of 5 on GOG. Door Kickers is a pauseable real-time strategy game (RTS) but not the usual kind of RTS where you're tank rushing the enemy base; in Door Kickers you control a group of counter-terrorists as they take on multiple missions involving hostage rescue and arresting of suspects. The game contains 84 missions, 6 campaigns and a level editor. The game also comes with an online co-op mode, if you own the Steam version. I got the game on sale in June 2016 off GOG along with a bunch of other games. I tend to like games that involve tactics which is why I'm a fan of more tactical counter-terrorist FPSs such as SWAT 4 and Rainbow Six: Siege, so Door Kickers seemed like a good game to try out. Hey Ying, does this look familiar to you? The game has all the iconic weapons you'd expect counter-terrorists to handle such as MP5s, M4s and Glocks, but also includes some less common weapons such as sledgehammers, the Six 12 shotgun and Vector SMG… in fact, all the latter weapons exist in Rainbow Six: Siege which makes me wonder if KillHouse Games are drawing their inspiration from Siege or Ubisoft is drawing their inspiration from Door Kickers 😉. As a result, the game feels like a tactical, top-down strategy version of Rainbow Six: Siege or Commandos except with Counter-Terrorists versus Terrorists. Preparation is crucial in Door Kickers, so it's important you pack the right gear prior to your squad going into the mission. 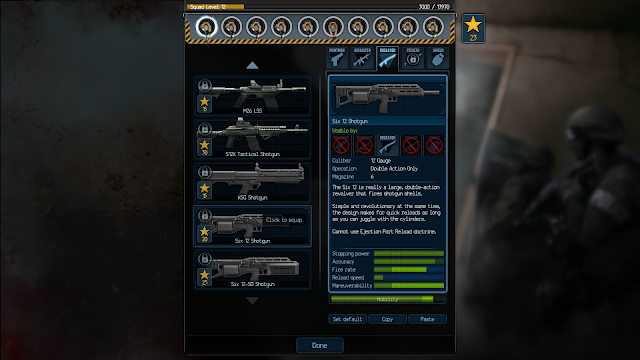 You'll get plenty of choices of guns, armour and gadgets to choose from, with all of them having different strengths and weaknesses: carrying a lot of armour will help give your operators a better chance at surviving but it also means they're slow and probably less likely to successfully defuse a timebomb. Also, weapons vary in terms of their stopping power, fire rate and accuracy and these things are important to consider depending on how heavily armoured your opponents will be and whether there are a lot of hostages/bystanders on the mission. Finally, even the choice of gadgets can affect mission performance: after it took a ridiculously long time to unlock a bank vault in order to rescue hostages during one particular mission, I decided lockpicking machines were a must for subsequent ones. Not only do you have to pick the right weapons but you also have to pick the right avenues of attack since the hostages are often used as human shields, especially later in the game. You'll have to become smarter when determining which direction to approach enemies. The game has multiple classes such as the Stealth class (which are basically operators that can use silenced weapons and don't automatically fire on sight), Breacher class (operators equipped with shotguns) and the Shield class (basically Monty from Rainbow Six: Siege). They all have their uses although I've never been able to actually do any good with them, except for the Assault class (which is basically the default class if you want to carry your standard array of assault rifles and sub-machine guns). I was actually late to the piece when I discovered this but you can actually customise your crew (which is a nice touch and, to be frank, one I would expect from these kind of games); sure, you're only able to pick portraits from a bunch of randomised images, but you can at least pick names and callsigns too. The game comes bundled with a level editor which definitely increases the longevity of the game. If you own the Steam version of the game, there are 43 Steam Achievements to earn and 8 Steam Trading cards to collect. The game has a tutorial on how to play but I somehow still manage to stuff up the most basic actions. For example, I still can't with 100% certainty figure out how to safely open doors. You have to left click then right-click in order to bring up a menu to do safe things like using the optiwand or throwing a flash grenade but sometimes (despite my best intentions, and usually when I'm too close to the door) you end up accidentally kicking the door open instead and often killing yourself! I only found out later that this mission is actually infamous for being one of the toughest in the game, and in the end, I eventually gave up on it. 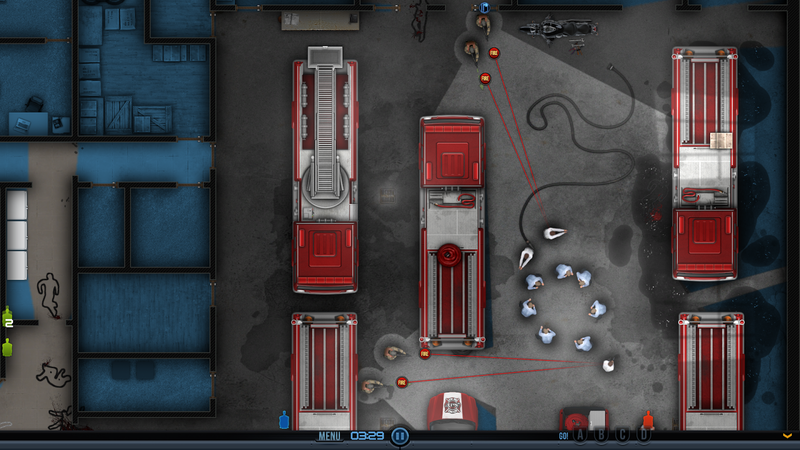 The mission is set in a fire station and a whole bunch of hostages are surrounded by terrorists in the garage. As soon as you start shooting at them, all hell breaks loose and there's a high chance of hostages dying. So, I decided that maybe using Stealth operatives would work better but unfortunately, I don't think it's possible having the operatives synchronise their shots to hit multiple targets at once. I even tried using Stinger grenades to disperse the hostages like the devs suggested in a particular thread I found, but again this only resulted in dead hostages. 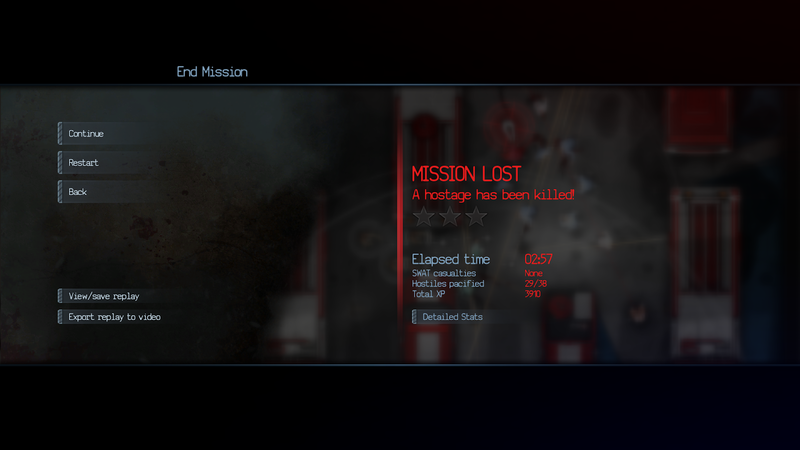 The game does mix things up a bit as you progress through the missions but ultimately, most of the missions are the same as they involve clearing the map of hostiles while you go and rescue hostages. I mean, don't get me wrong, most of the time this game is fun, but it does lose its sheen somewhat after you've progressed quite far into it, especially if you're having to repeat missions over and over again like I have. Later in the game, you'll come across levels where you have heavily armed and armoured opponents out in the open. On earlier maps, you're able to use tools such as the optiwand to see what or who is lurking behind a door, however you're lacking this ability to gather intel when enemies are out in the open. It would be nice if there was an ability to use a drone to scout ahead like in Rainbow Six: Siege or even have the ability to deploy a spotter. A competent, top-down, tactical RTS game where you get to plan and execute counter-terrorist operations. The game can be frustrating at times especially as you progress to more difficult levels later on, so long-term enjoyment of the game depends on whether you're a guru at tactics games or whether you're just really persistent. Is the game worth $9.99 USD? : Definitely. Mind you, the price quoted is purchasing the game directly off the developer's website; if you're going to get the game off Steam it's $19.99 USD and $19.99 AUD off GOG. So, not as good value on those platforms, but I still think it's worth it even at 20 bucks.